Houses are not just places to put a person’s possessions. They are residences that reflect the people who live in them in some way. As a realtor, I believe finding the perfect home and decorating it accordingly are very personal experiences for every owner. That’s why when I came across Norling Wakeman Studios, I immediately knew that this Summit County business has something quite distinctive to recommend to new and existing homeowners alike. Recently, I spoke with Bonnie Norling Wakeman, who co-owns Norling Wakeman Studios with her husband Joe Wakeman. She told me about their businesses, which are all designed around creating beautiful sculpted wall art and artistic furniture finishes in private homes and at commercial companies. 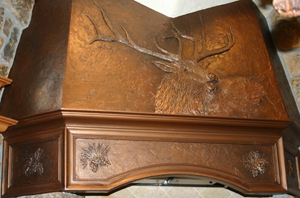 Bonnie explained that Joe focuses on making beautiful faux finishes on walls and artistic finishes on cabinets. 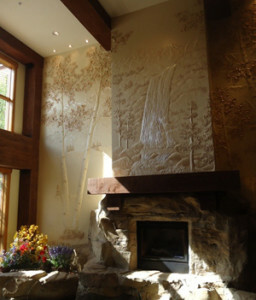 While she also creates innovative wall textures, Bonnie’s art is a bit different from her husband’s expertise. Based on the photos Bonnie sent me, I can see why her clients are wowed by her art. It’s pretty amazing. Both Bonnie and Joe make sure to stay on top of every new technique in their industry so that their work is always cutting edge. In addition, Bonnie and Joe are very active in various organizations related to home building. As members of the Summit County Builders Association (SCBA), they also regularly participate in the SCBA Home Show and the annual Parade of Homes. If you want some more examples of how Bonnie and Joe can add gorgeous elements to your home, check out the website for Norling Wakeman Studios. You’ll definitely think of walls and furniture in a whole new way! Norling Wakeman Studios is just one of many fabulous small businesses that are located here in Summit County. If you’d like to know more about what you can find in this awesome area, I’m happy to give you whatever information you need.